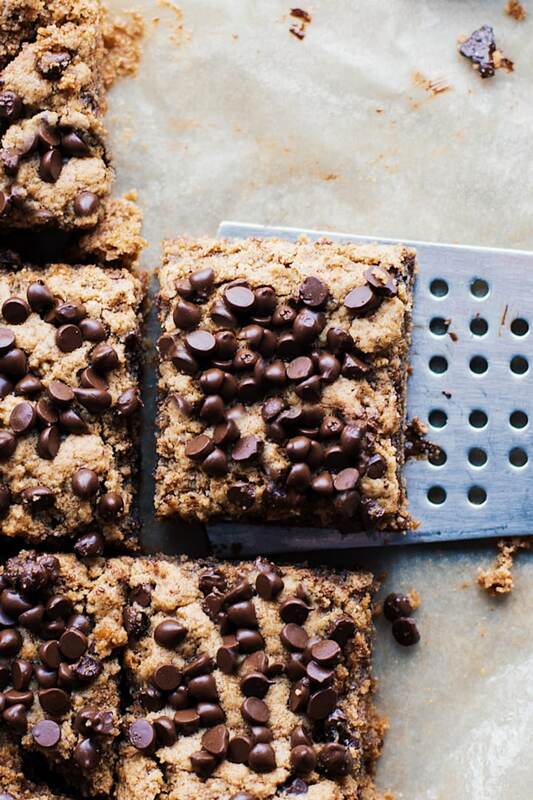 Thick and chewy Almond Butter Chocolate Chip Blondies – an amazing gluten free & paleo friendly dessert that is gooey, chocolate-y, and so addicting. No flour, naturally sweetened, with rich and decadent results – all you need is 1 bowl, 30 minutes to make, and a handful of wholesome ingredients. 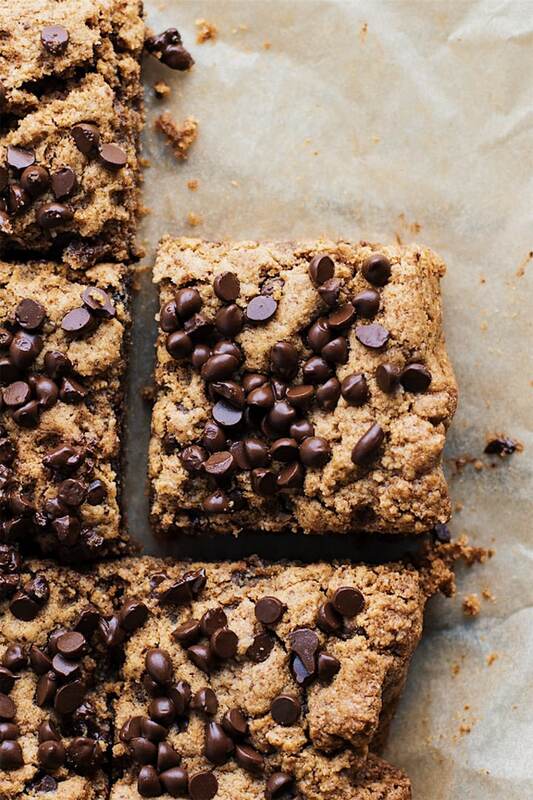 Currently obsessed with these thick, gooey almond butter chocolate chip blondies. There is nothing better than finding a dessert recipe that satisfies the sweet tooth and tastes decadent and delicious! These bars are just that. 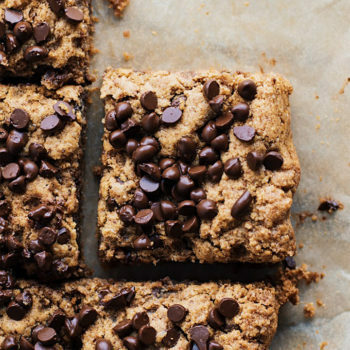 Made with almond flour, coconut sugar, and creamy almond butter – resulting in the most chewy dessert bars. All you need is 1 bowl, 30 minutes to make, and a handful of wholesome ingredients. A blondie is a dessert bar also known as a “blonde brownie.” It has the same texture as a regular brownie but is made without cocoa. 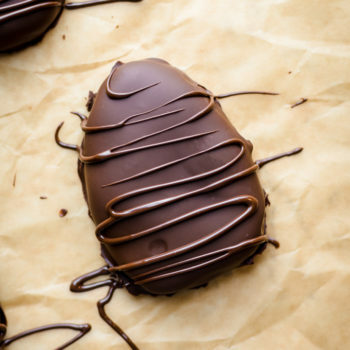 They are usually flavored with toffee, peanut butter, or chunky candies for added texture. 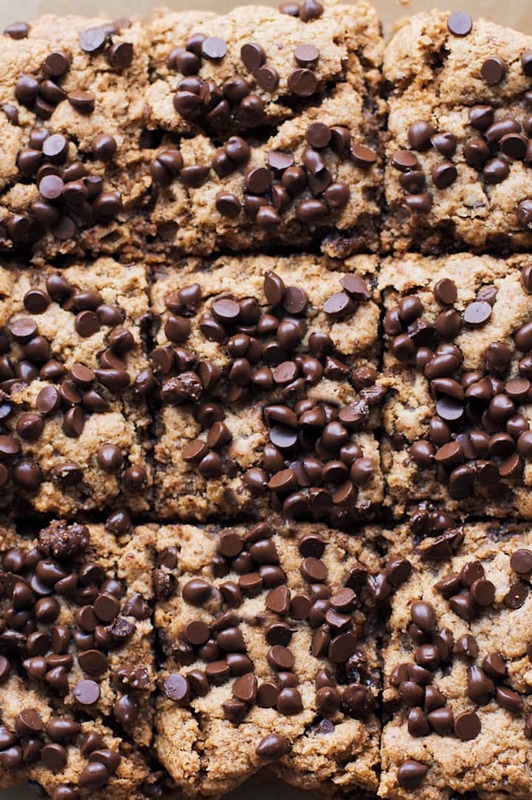 Blondies also resemble cookie bars – but are made with all brown sugar instead of granulated white sugar. 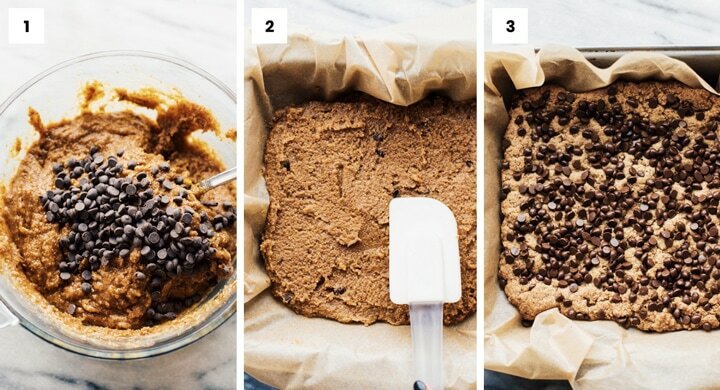 First, mix all of ingredients in a medium sized bowl – reserve most of chocolate chips for later. Then line 8×8 pan/dish with parchment paper, pour batter into pan and spread out evenly. Sprinkle chocolate chips over top then bake for 23 minutes at 350F. Remove pan from the oven, let cool for 10 minutes, then remove by lifting the edges of the parchment paper out of the pan. Slice into bars and enjoy! 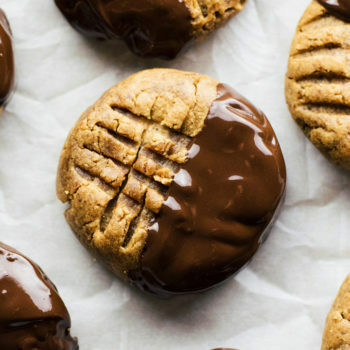 For this recipe I used almond butter – you can also use peanut butter or cashew butter instead. 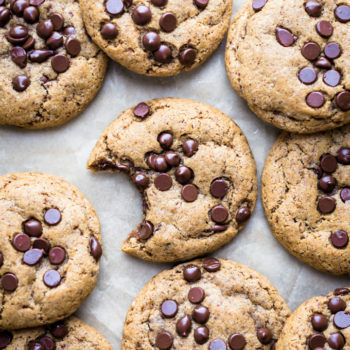 This recipe doesn’t have to be gluten free or used with just almond flour – replace the almond flour with regular all-purpose flour or a gluten free flour blend. Store these bars in a sealed ziplock bag or container at room temperature or in refrigerator to stay extra fresh and chewy. Thick and chewy Almond Butter Chocolate Chip Blondies - an amazing gluten free & paleo friendly dessert that is gooey, chocolate-y, and so addicting. All you need is 1 bowl, 30 minutes to make, and a handful of wholesome ingredients. Preheat oven to 350F. In a medium bowl, mix almond flour, coconut sugar, cinnamon, and baking soda. Then add rest of ingredients and 1/4 cup chocolate chips. Line a 8x8 pan/dish with parchment paper (edges up). Pour batter into pan and spread evenly - sprinkle remaining 1/4 cup chocolate chips over top. Bake for 23 minutes or until center is set. Let cool for 10 minutes then lift edges of parchment paper to remove blondies. Slice into squares and enjoy! For this recipe I used almond butter - you can also use peanut butter or cashew butter instead. This recipe doesn't have to be gluten free or used with just almond flour - replace the almond flour with regular all-purpose flour or a gluten free flour blend.